Team Vestas Wind have recruited two talented and experienced offshore sailors to join their crew for the planned return to the Volvo Ocean Race 2014-15 from Leg 8. Team Vestas Wind have recruited two talented and experienced offshore sailors into their crew for the planned return to the Volvo Ocean Race 2014-15 from Leg 8. The team will be joined from the Lisbon stopover onwards by Tom Addis and Simeon Tienpont. Addis will navigate the Vestas Wind boat throughout the final legs of the race. Tienpont will replace Tom Johnson as bowman as the latter has decided to accept a position within the Oracle Team USA. Australian Tom Addis, 45, is a two-time Volvo Ocean Race veteran - having competed with both PUMA and Teléfonica Blue as navigator in previous editions - and has participated in multiple transatlantic crossings and Sydney to Hobart races. His engineering and mathematical background is a welcome addition to Team Vestas Wind for the relatively short and technical legs from Lisbon onwards. Experienced Dutch sailor, Simeon Tienpont. 33, formed part of the America's Cup winning team Oracle Team USA on two occasions and has one Volvo Ocean Race under his belt as an under 30 with ABN AMRO TWO in the 2005-2006 edition of the Race. "I'm extremely satisfied with the composition of the team - our profiles are compatible and morale is high," skipper Chris Nicholson said. "I know both Tom Addis and Simeon Tienpont well, and I'm sure they'll fit in seamlessly, positively contributing to the dynamics and performance of the team. "Now as a complete team, we're solely focused on rejoining the race in Lisbon and on putting in our best performance for the remaining legs of the Volvo Ocean Race 2014-2015," Nicholson said. Vestas Chief Marketing Officer and CEO of Team Vestas Wind, Morten Albæk, said: "I am very pleased that Chris succeeded in hiring such strong sailors with a good combination of experience and motivation. "I am very proud of all the hard work put in by the team in regards to the rebuild of the boat - in particular I would like to thank Persico Marine for an exceptional job - and I can't wait to see the crew and the boat in Lisbon." 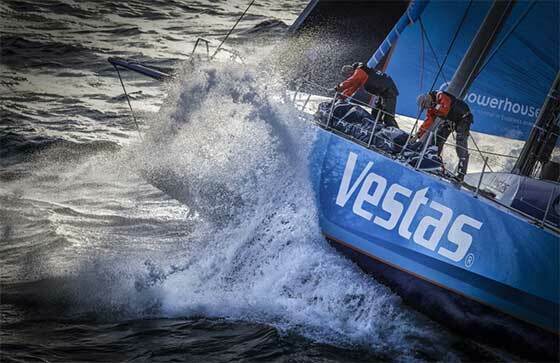 No further adjustments to the Team Vestas Wind crew are expected to be made ahead of the Leg 8 start in Lisbon. * Team Vestas Wind's crew was grounded in Leg 2 and the boat has been rebuilt in the Persico boatyard in Bergamo, Italy.